In order of occurrence that is! Yesterday I had a HUGE health proficiency to do. You can read all about it at my other blog Nothing Off Limits. It was hard to say the least, and been a very stressful week. I passed though and I am so happy. I feel like maybe I CAN do this. Seriously I go through doubts all the time. It's really very very difficult. I realize now pretty much all the nurses going through nursing school go through the same thing. We all get nervous from time to time. It gets very difficult and we just don't understand how we'll do it. The great thing is that immediately after my proficiency, I was on spring break. I am off for a week!!! I am so excited. I slept in today. It feels pretty good! 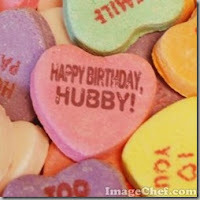 It is also my hubby's birthday today. I wanted to wish him a very happy birthday. I love you sweetie!!!! The sickness passed, everyone is healthy again thank goodness. Tomorrow I have a huge proficiency in health, which I am currently studying for, then it's spring break for me. I am so anxious. I seriously need this break. I will savor each day. My next 3 month follow up is the 16th. I'll be seeing my doc and getting the very important checkup that tells me that nasty cancer is still gone. Two years and going strong folks! Pray that nasty disease stays far away from me. Like I have said before, cancer is a bully and no matter what I refuse to let it scare me anymore. It took my dad, it tried to take me and basically Gabbi too. You could say I have a personal vendetta against cancer, but then again, which one of us doesn't? I just happen to be in training now to fight it. LOL Yep. Nursing school! !